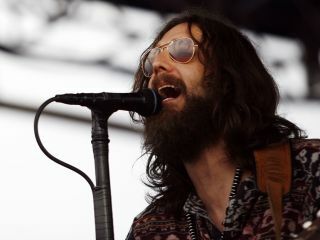 Are singer Chris Robinson and The Black Crowes saying 'farewell' or just 'till next time'? Are The Black Crowes about to say farewell yet again? This summer, the band will kick off their Say Goodnight To The Bad Guys 2010 Tour, which will feature three-hour performance sets in most markets. "Say Goonight To The Bad Guys"? There's not too many ways one can take that little line lifted from Scarface. Or is there? The tour will begin on 13 August in Milwaukee, Wisconsin and is scheduled to conclude with the band's annual multi-night stand at the Fillmore in San Francisco on 19 December. As to whether this is the end of the band - they've already broken up once - singer Chris Robinson said, "With a smile so wide you can count my teeth and with a heart so full of love that it is spilling over the rim, I offer a humble and simple thank you. Thank you for your time, your imaginations, your heartaches and joy. "Thank you for 20 years of cosmic rock 'n' roll. Twenty years of keeping it weird. Twenty years of chasing horizons...This year the music is only for you as we celebrate what has been, what is now and whatever will be." Brother Rich Robinson offered these thoughts: "At this milestone in our career, I feel very fortunate that I have had the opportunity to spend my life making music. It's been 20 years since we started out on this journey. I would like to extend my deep gratitude to all of our fans who have been there with us along the way. We would not have gotten here without your support. "Every night I stand on the stage I feel great pride and respect for what we share with our fans. After this tour we are going to take some much needed time to spend with our families. But for now, we are very much looking forward to a great year of touring. I look forward to seeing all your familiar faces again on the road. See you soon." So if it's not 'farewell,' perhaps it's just a long 'till next time'? We shall see. For full tour date information, visit The Black Crowes website.